Get your Nelson's New Illustrated Bible Dictionary at discount, wholesale, cheap. This completely revised and updated edition is the most comprehensive and up-to-date Bible dictionary available. A wealth of basic study information is found in more than 7,000 entries plus over 500 full-color photographs, maps, and pronunciation guides. Includes the Visual Survey of the Bible. 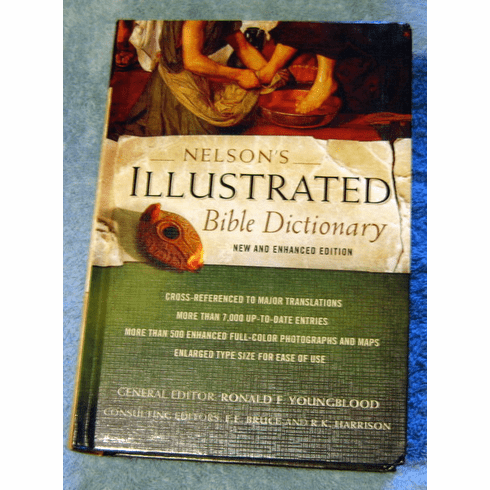 Nelson's Illustrated Bible Dictionary: is the most comprehensive and up-to-date Bible dictionary available. This enhanced edition includes basic study information with over 7,000 entries and 500 full-color photographs, maps, and pronunciation guides. Get your Nelson's New Illustrated Bible Dictionary at discount, wholesale, sale priced, inexpensive and even cheap.